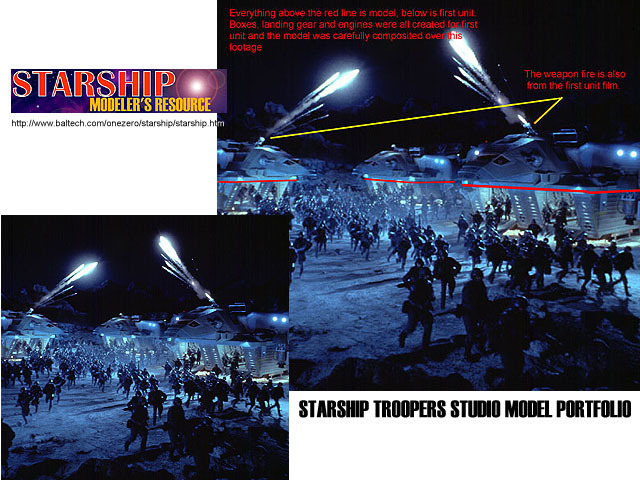 This page is dedicated to the studio models used in filming the movie STARSHIP TROOPERS and is intended as a guide for hobbyists who wish to model the vehicles seen in the film. 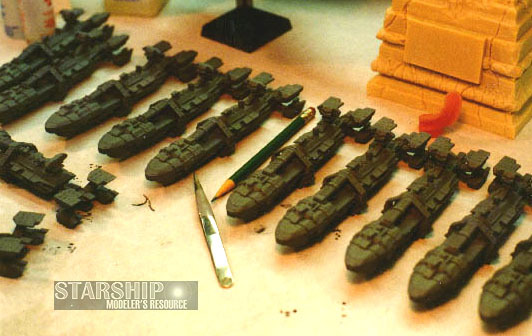 The bulk of the Starship Troopers models were created by the crew of the Thunderstone Model Shop in Culver City, CA. 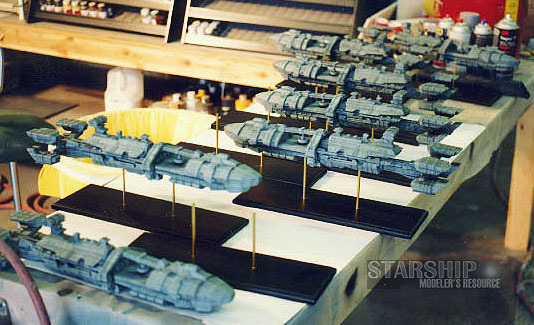 They labored for nearly a year and a half to craft these amazing starships. A few of the feature's models were created by other shops. Boss Films (now, sadly, defunct) was responsible for the amazing sequence where the Rodger Young grazes an asteroid; ILM created some models for use around the Ticonderoga Battle Station (the station itself was built by Thunderstone) as well as the Lunar Ring sequence. The sections below are divided up by ship type. The most notable is the Rodger Young class vessels - the backbone of the Earth fleet. There are also sections for the TAC Fighter (a ground support craft) and the Dropships which deliver troops to a planet's surface. Image 1: Close up of the back of the 18' Rodger Young's bridge. A small model of the Millenium Falcon is clearly seen, clinging to the bridge's backside. Image 2: A view looking for the rear of the 18' model. A person stands next to it as a comparison. Image 3: A well lit shot of the 18' model from the side and slightly forward. Image 4: A lineup of 18" Rodger Youngs on a workbench. Image 5: A close up of the nose section of the blue-painted 9' model, carrying markings for ship number 138: Yamamoto. Image 6: A collection of 6" Rodger Youngs. Awwww. So cute! The Rodger Young was the most important model created by Thunderstone. Everything that happens in the movie revolves around this ship and the others based on her design. 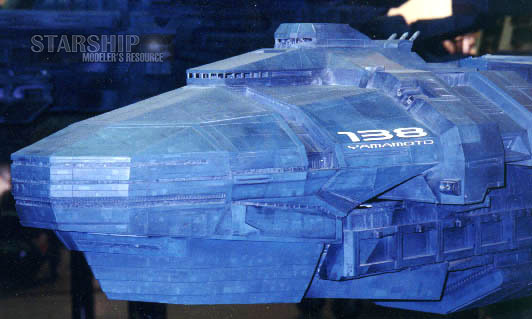 This design required more versions and sizes than any other model in the movie. The smallest of the Rodger Young's was the 6" model. They were created specifically to encircle the huge Ticonderoga Battle Station and aren't used anywhere else in the movie. Next up was the 18" model. This model was originally only a rough maquette. It was intended as just a tool for planning shots and was never supposed to be seen on screen. However, the filmmakers eventually decided these ships could be used in the background for the large fleet shots. Instead of shooting one ship and duplicating it many times (standard practice) most of the fleet shots actually include as many as a dozen individual models. The maquettes' detail was 'tuned up' and fiber-optic lighting was added to make them camera-ready. The workhorse of the Rodger Young series was the 9' model. Three full 9' versions were created. Each was painted a different color - Green, Tan and Blue (in the film one generally only notices the tan color as being different). The markings on each were readily swapped to change ship designations. Of course, moving the ships themselves was not so easy. For shots where the ship fills the screen, something with a little more detail was needed. The 18' model was created for this purpose. The high detail allowed the camera to get in really close without betraying the model's actual size. Boss Films created an 18' model of their own, using the Thunderstone molds, to do the shot where the Rodger Young grazes an asteroid. 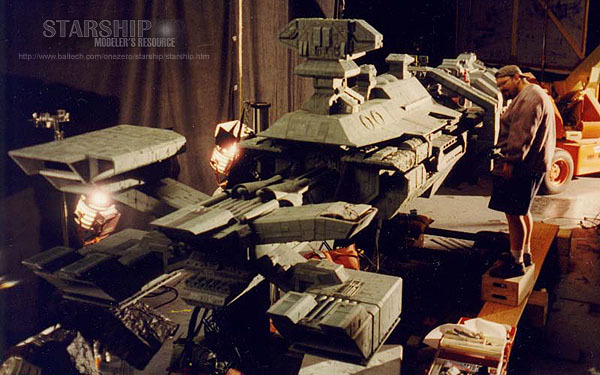 In addition to these models, ILM built their own 36" version of the Rodger Young. 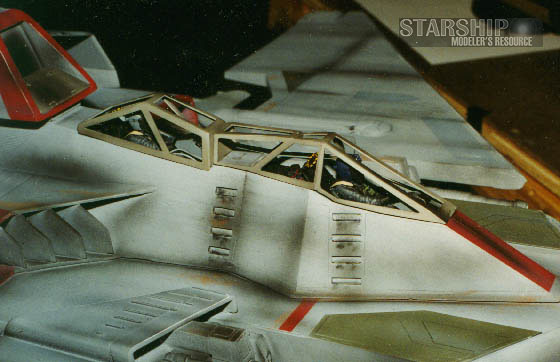 Image 1: A fine top view of the large TAC Fighter on the filming stand. Image 2: A detail shot of the cockpit area of the "hero" TAC Fighter. Image 3: One of the 6" TAC fighter models with wings in the folded configuration. 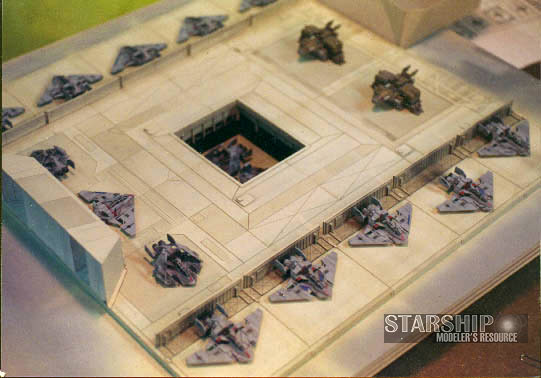 Image 4: A close up of the small TAC fighters on the hanger deck. 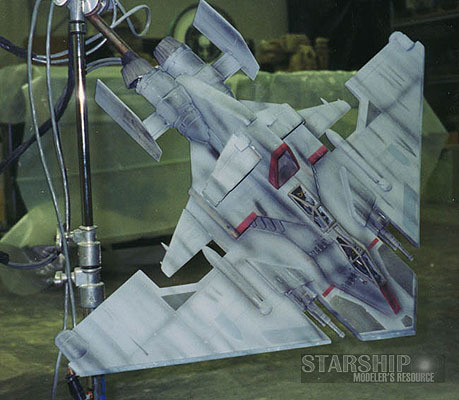 The Tac Fighter was the first model completed and shot for the movie. Although one sees the fighters traveling around in groups, there was only one "hero" model created. It was roughly 1/20th scale. Two other sizes were created, as well: one in scale with the 18' Rodger Young with a 6" wingspan, and another scaled with the 9' Rodger Young. The smaller fighters were created mainly to use with the Carrier Deck versions of the Rodger Young-style ships. They were also used among the debris pieces created for the different destruction sequences. The hero model was fully painted, start to finish, in about three hours. Although the fighters pictured are all gray, the actual craft are supposed to have an unpainted, bare metal finish. 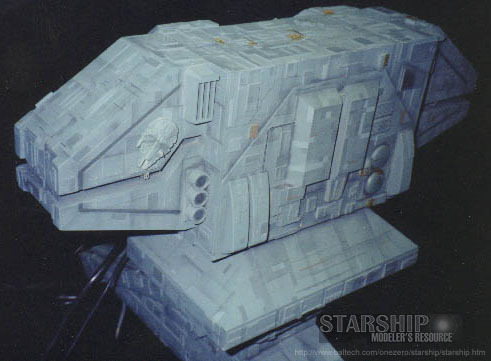 The models were painted grey because the filmmakers feared an actual metal paint wouldn't scale properly. Better to let the computer guys add highlights, if they were required. As it turns out, the Tac Fighters are probably the least seen model in the movie. Image 1: One of the pyrotechnically-rigged Dropships. 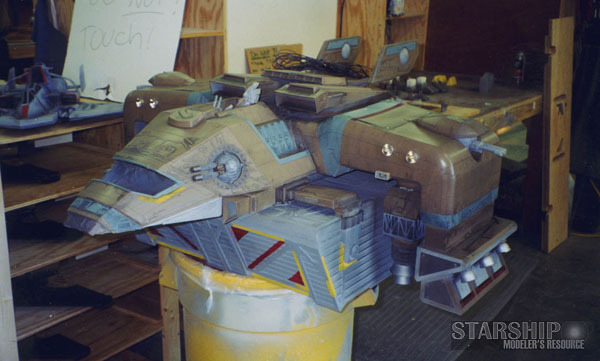 Image 2: A side view of the large Dropship model. Image 3: Rear view of the same ship. 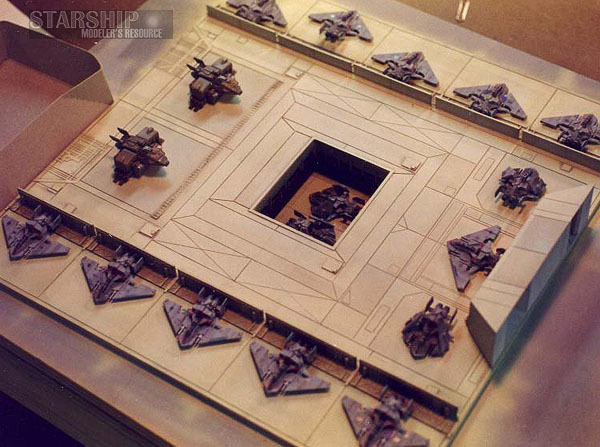 Image 4: A view of the tiny TAC Fighters and Dropships on the Rodger Young's hanger deck. The Dropship is the main orbit-to-ground troop transport of the fleet. It consists of the main body and a cargo box which the troops ride in. The original design seemed to call for the dropship to discharge the cargo box and then take off, probably going back to get more troops. Unfortunately, that's not how they're used in the film. The largest of the Dropships had a wingspan of about 30". It was initially used in this shot of the troops debarking from the ship. Everything above the top of the cargo-box is the model. Even though three are shown only one model actually existed. Later in the show the rest of the model was completed and added to the the existing shell. This composite was used for the scene where the Dropships land. What's most impressive about this shot is that it goes directly from the model to live action without a cut - there's no way to tell when the changeover occurs. 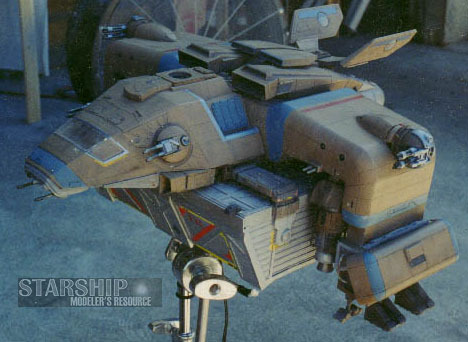 A smaller version of the Dropship was also kitted out to be a hero. It was used for most of the other shots. The smaller model is most often seen onboard the Rodger Young, and then deploying to the planet surface. Again, only one was created but is used many times over by changing decals and paint. 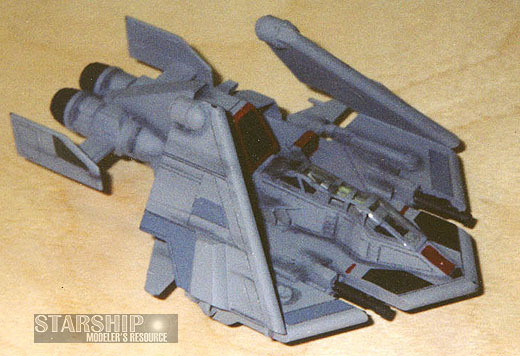 Eight pyro Dropships were created to be filmed by the pyro unit to represent the craft that, quote, "don't make it". The models were lined with primer cord then suspended by a wire. They were then sent down the wire and blown to bits in mid-flight. 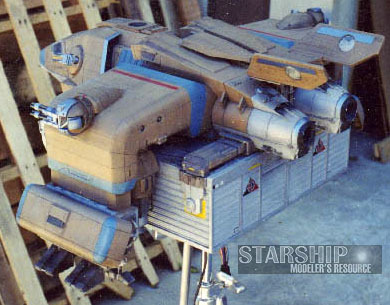 Toward the end of filming the smaller model was modified to represent the updated version of the Dropship. Only minor changes were made to the model and paint but I think the result was a little more sleek. Article text by Jay Adan, who served at Thunderstone Models as a model painter for the Starship Troopers project. 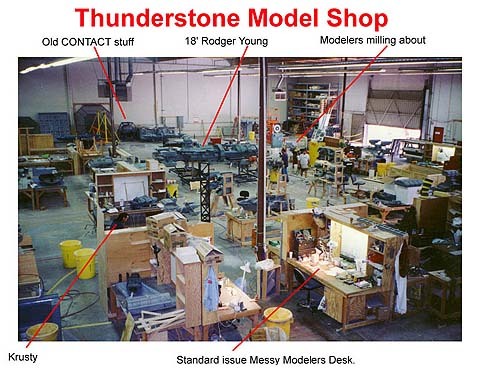 Images contributed anonymously, except the Thunderstone Model Shop photo, which is by Jay Adan. Starship Troopers names, characters, images, and all related indicia are © Sony Pictures Entertainment. This page is best viewed by a system carrying the 'Haettenschweiler' font. Please direct comments, questions, corrections, and picked nits to John at OneZero@aol.com. Created 4 May 1998; last updated 29 December 2004. This page copyright 1998-2004, Starship Modeler. Article copyright 1997, Jay Adan.